Busted – Featured image for Capital Fringe Festival Highlights, Washington Post Weekend Section, July 2, 2010. I’m a writer, multimedia artist, and arts administrator who’s equally comfortable with both digital and analog design. I bring depth of experience and a willingness to explore new options to every new project I undertake, no matter what the medium or environment. I’ve worked with educational arts organizations, commercial enterprises and non-profit associations. Whether you’re looking for a fresh new take on existing material or you’re starting from scratch, I’ll give you the results you need. Let me help you tell your story. My portfolio includes both digital and traditional studio art. 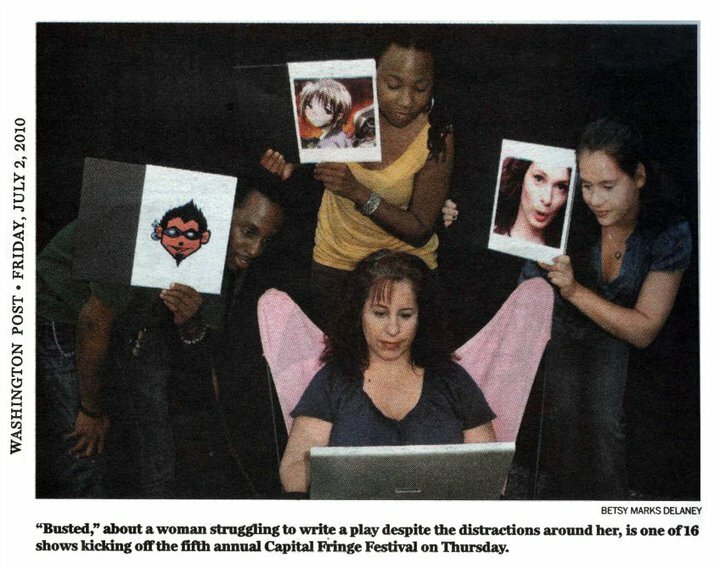 My work has appeared in the Washington Post (the highlighted image is from the 2010 Capital Fringe Festival guide featured in the Weekend Section), in student invitational exhibits at Howard Community College, for the Greenbelt Arts Center, and online in the Costume-ConNections Online Archives. My first gallery hang was summer, 2014 at the Greenbelt Arts Center, and my drawing “Fish Scales and Bark” received an award for Drawing during the Greenbelt Labor Day Festival, 2014. I received my second BA, in Graphic Communication, in May, 2016. This portfolio is a work in progress. Check back frequently for updates. Thanks for your consideration!